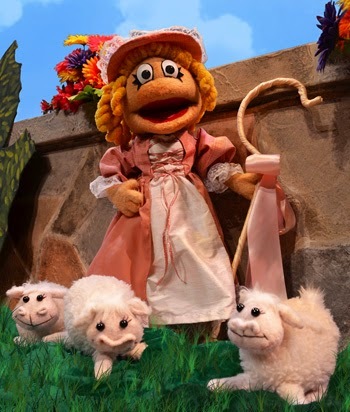 Adapted and directed by Amy Sweeney, Shake a Tale Feather with Mother Goose is a new production for Theater for the Very Young, featuring performances by expert puppeteers Luis Hernandez and Mandy Mitchell. The production includes hand-and-rod and shadow puppetry styles. All puppets, props and scenery are crafted in house by Center for Puppetry Arts’ expert staff, including head puppet designer Jason von Hinezmeyer and scenic designer Ryan Sbaratta. Shake a Tale Feather with Mother Goose is appropriate for ages two and up and will be performed in the Downstairs Theater, August 21- September 21. A half-price preview will be offered August 19-20, 10 a.m. and 11:30 a.m.
· Thursday – Friday: 10 a.m. & 11:30 a.m.
· Saturday: 11a.m., 1p.m. & 3 p.m.
· Sunday: 1p.m. & 3 p.m.
Tickets include Museum admission and entrance to the Create-A-Puppet Workshop (or To-Go Kit), where children can piece together their own Jumping Cow Shadow Puppet to take home.